Golf registration will be separate at this training. If you are interested in golfing, please contact Brian Wright at bwright@eloyaz.gov or 520-251-0028. 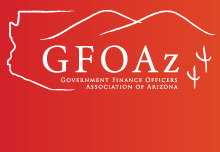 GFOAz will host the GFOA CPFO exam at the training. If you would like to participate in the exam, please complete the GFOA application at www.gfoa-cpfo.org. If you are interested in participating in the GFOAz Education Committee meeting to plan the upcoming trainings and conferences, please e-mail info@gfoaz.org. Most employers are facing increasing pension contributions. The past two years have seen many changes to the Arizona Public Safety Personnel Retirement System. This session will review recent reform (i.e. SB 1428 and Prop 124) and discuss the factors contributing to the increases (i.e. Hall V. Elected Officials' Retirement Plan case and reductions to the assumed earnings rate). It will also discuss strategies for managing your pension costs long-term such as the the ability to make a one-time election to extend your amortization period up to 30 years. Please take this time to network with the platinum sponsors at their booths in the Lobby Foyer. If you are interested in participating in the GFOAz Membership Committee meeting, please e-mail info@gfoaz.org. GPLET 101: What is it and How Does it Work? Learn about what Government Property Lease Excise Tax is, how it works, impacts (policy, community, education, property taxes) and what the recent legislative changes mean. Hear case studies and the use of GPLET by the City of Phoenix. Have you wondered about the annual assessed valuation calendar and process in your County Assessor's Office? Interested in how net new construction is calculated? How are property exemptions factored into the values? Do tax roll corrections impact your annual levy? What are the definitions of full cash, limited property, primary and secondary taxes, net assessed value? How can you prepare for/plan for a significant drop (or significant increase) in assessed value between February and August? All conference attendees are invited to attend the luncheon. Speakers: Larry Given, Director, FirstSouthwest, a division of Hilltop Securities Inc.
Logan McKenzie, Managing Director, CoBiz Public Finance, Inc.
Zach Sakas, Gust Rosenfeld P.L.C. Since the Great Recession, bond sales via direct bank placements have seen a rise in popularity among issuers. This panel includes representatives from bond counsel, financial advisors, banks, and issuers to discuss how these transactions are accomplished today, recent updates and best practices, and how these transactions might change in the near future based on regulatory changes. Managing an effective capital planning program is essential to the long-term financial health of an organization. This session will review best practices in identifying and communicating capital needs, developing a long-term capital plan, prioritizing projects, and preparing and monitoring a capital budget. Please take this time to network with the platinum sponsors at their booths in the conference prefunction. Jill A. Shaw, CPA, Partner, Heinfeld, Meech & Co. Receiving federal funds often comes with strings attached, one of which is the possibility of a Single Audit. During this session we will cover the fundamentals of expenditure reporting with a particular emphasis on federal expenditures and helpful tips to prepare an accurate Schedule of Expenditures of Federal Awards (SEFA). In addition, we will spend some time covering common findings over the preparation of the SEFA. This session will provide an update on the national economy and some perspective into Arizona-related economic topics. Mark Reader, Managing Director, Stifel, Nicolaus & Company, Inc.
Randie Stein, Consultant, Stifel, Nicolaus & Company, Inc. This session will provide an update of actions taken by the Arizona legislature during its last session including changes to the Community Facilities District (CFD) Act regarding district formation, governance and other new limitations; technical changes for issuance of general obligation bonds to address amortization of premium in certain cases and limitations on effects of bankruptcy of issuers; treatment of tax collection fund balances in connection with setting levies and more. This panel will provide an update for members on a variety of timely legislative issues. Representatives from the League of Arizona Cities & Towns and County Supervisors Association will provide an overview of the 2017 legislative session, and explain the challenges and opportunities we currently face. CPE forms will be available at the registration table immediately following conference conclusion.